Welcome to our detailed review of Walgreens Clotrimazole Antifungal Cream. This product is used to help treat fungal infections such as athlete’s foot, jock itch and ringworm. It can also help alleviate other symptoms such as itchiness and burning sensations. Read our complete review below to know more about this anti-fungal treatment product. 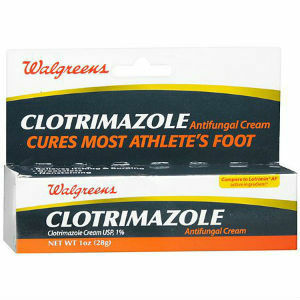 Before applying Walgreens Clotrimazole Anti-fungal Cream you must first clean the infected area completely. Wash it with warm water and soap and dry your feet thoroughly. Afterwards you can apply a thin layer of the cream over the affected area. Do this two times per day, ideally during the morning and again at night. You can also ask your doctor for the appropriate dosage per day. If you are treating athlete’s foot take special attention to the areas between the toes and apply the cream on that part as well. Remember to always wear well ventilated shoes and clean socks. 4 weeks is the time it takes for results to be visible and for jock itch, it usually only takes 2 weeks of daily treatment. This is not effective for use on fungal infections on the scalp and nails. There are several side effects that can occur when using this product. The most common one being itchiness and irritation. Some also claimed that they felt a burning sensation when the cream was applied and an acute pain that lasted for a couple of minutes. If any of these side effects occurred after using this anti-fungal cream it is advised that you discontinue use and check with your doctor for an alternative. A tube of Walgreens Clotrimazole Anti-fungal Cream contains 14 grams of the formula and can be purchased for about $6.79 on their official website. It is also available on other online stores but is commonly found to be more expensive with some being priced at $11.40. It is best to purchase this one from the manufacturer’s website as they also offer a 50% discount for the second tube if you are planning on buying two. There are also discount coupons that you can use on their website. The official website includes a reasonable return policy which allows customers who are not satisfied with the results to return the product within 30 days of the purchase date. If bought from their website you can either choose to mail it back to them or bring it to one of the Wallgreens stores near you. Simply bring the product as well as the official receipt to get a full refund. The Walgreens Clotrimazole Antifungal Cream is an affordable anti-fungal treatment that comes with a great money back guarantee clause. It also utilizes some tried and tested components that are known to be effective in eliminating fungal infections on the feet. There is an issue with the fact that there are no available customer testimonials to go by when it comes to its effectiveness on a larger scale of users. Also, 14 grams is a bit low for a 1 month maintenance supply which is usually the duration it takes to treat fungal infections such as athlete’s foot. Jimmy Rodriguez	reviewed Walgreens Clotrimazole Anti-fungal Cream	on November 19th	 and gave it a rating of 3.